Sciatica is an extremely painful condition that Western medicine typically treats with either pain pills or surgery. Unfortunately, pain pills have numerous adverse side effects. By now, nearly everyone has heard of the opioid epidemic, but even over-the-counter pain medications aren’t safe for long-term use. Not because of addiction fears, but the damage they do to your body, particularly the liver. And surgery is not an option for most sciatica patients. However, you can treat the condition – and accompanying pain – with acupuncture. Sciatica is the result of inflammation of the sciatic nerve. Most patients only experience it on one side of the body. The sciatic nerve branches from your lower spine before running through both hips and down the backs of both legs. When that nerve becomes pinched, you get sciatica. The most common cause is a herniated disc, but bone spurs on the vertebrae, a bulging disc, or spinal stenosis (narrowing of the spine) may also cause pressure on the sciatic nerve. That pressure causes inflammation, which in turn causes pain and sometimes numbness of the affected leg. Pain is often severe but most patients are not candidates for surgery. Typically, that treatment is reserved for those who experience additional symptoms, such significant weakness in the leg and issues with their bowel or bladder. Acupuncture has been used to treat chronic pain for thousands of years. It is also effective in treating sciatica, which is considered a channel disorder in Chinese medicine. To treat sciatica with acupuncture, your acupuncturist stimulates acupuncture points to remove the channel obstruction causing your sciatic pain. This treatment may include needle insertion, manipulation, radiant heat or moxibustion, and stimulation with lasers or electric pulses. A number of studies reveal the efficacy of acupuncture in treating both pain and sciatica. 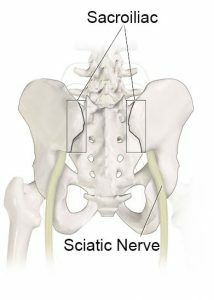 The main symptom of sciatica is pain that radiates from the lower spine (lumbar region), moving through the buttocks and back of the leg. In other words, the pain travels along the sciatic nerve. You may feel discomfort anywhere along that pathway, but it most often originates in the lumbar area and radiates downward. Your discomfort may be anything from a mild aching to intense pain. Some patients report a burning sensation or feeling a jolt similar to an electric shock. Prolonged sitting tends to aggravate the condition, as does sudden, sharp movement such as a sneeze or cough. The affected leg or foot may experience tingling or numbness. Or, you may feel pain in one area and numbness in another. The majority of sciatica patients experience relief of symptoms within a few weeks. These are signs of something more severe than sciatica and require immediate medical intervention. If you’d like to learn more about how Accurate Acupuncture can help relieve your sciatic pain, complete our contact form or call us at 928-274-1980.